Imabari (今治市, Imabari-shi) is a city in Ehime Prefecture, Japan. It is the second largest city in Ehime Prefecture. Following a recent merger, as of January 1, 2010, the city has an estimated population of 172,384 and population density of 410.87 persons per km². The total (merged) area is 419.56 km². The area in which Imabari is situated had long been a strategic point for the control of the Seto Inland Sea. As a result, it was controlled by a variety of forces throughout the warring period, including a number of inland sea pirates. The city was officially founded on February 11, 1920. 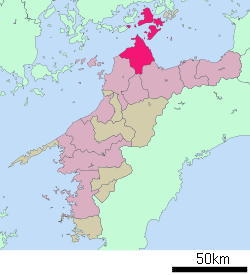 On January 16, 2005, the towns of Hakata, Kamiura, Kikuma, Miyakubo, Namikata, Ōmishima, Ōnishi, Tamagawa, and Yoshiumi, and the villages of Asakura and Sekizen (all from Ochi District) were merged into Imabari. As a result, there are no more villages within Ehime Prefecture. Imabari is home to a large number of shipbuilding and maritime servicing facilities along the northern and eastern coastlines of the city. Facilities include a small container port and maintenance and construction shipyards belonging to Imabari Shipbuilding, Japan's largest ship builder. The port has also long been a trading center within Shikoku. The city is home to a large cotton processing industry, with particular emphasis on towels. The city produces around 60% of the towels produced in Japan. As of 1998, there were over 200 towel production plants in the city. The city also specializes in the dyeing industry. In the center of the city lies Imabari Castle. 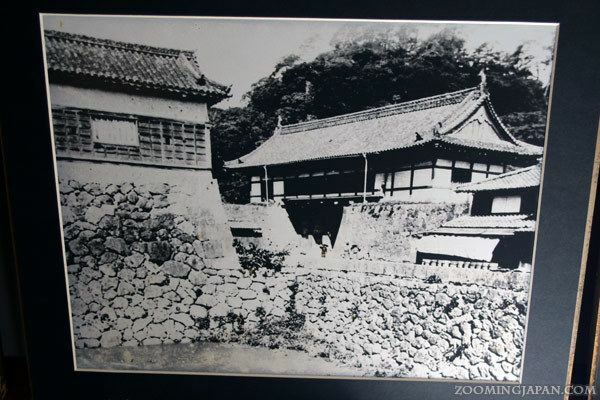 It was built by Tōdō Takatora in 1604. The castle is unusual in that seawater is used in its moat. Imabari has six temples of Shikoku Pilgrimage from 54 to 59 which are Enmeiji, Nankōji, Taisanji, Eifukuji, Senyuji, and Kokubunji. Imabari is also the location of the Toyo Ito Museum of Architecture opened in 2011. The city is serviced by Imabari Station on the JR Shikoku system. It is a main station on the Yosan line with limited express service. The Kurushima-Kaikyō Bridge, a toll road suspension bridge and integrated expressway, connects Imabari and Shikoku across a series of islands in the Seto Inland Sea to Hiroshima Prefecture. Opened in 1999 the bridge is part of the Shimanami Kaidō, a features both a expressway for road vehicles, as well as dedicated pedestrian and cycle lanes. The city is also home to two large maritime port facilities, and acts as a hub station for many of the ferry systems that link nearby smaller islands. Shikuichi Shigemi (1865–1928), novelist and academic, was born in Imabari. A teacher at Gakushuin and practiced as a medical physician in Tokyo. Wrote and published A Japanese Boy by Himself in 1889, while studying at Yale University. Kenzo Tange (1913–2005), noted modernist architect, born in Osaka, but spent much of his early school years in Imabari. Returned to design Imabari City Hall in 1958. Miyake Tomiki (1961 - ) Blues / Folk guitarist / comedian.